The Nevada rental agreements are written pursuant to allow a landlord and tenant to be able to come to terms over the use of property. The contract usually spells the monthly payment amount, time period for the stay, and any other conditions agreed upon by the parties. Once the document has been written and signed it becomes legally binding to both landlord and tenant. Rental Application – Used by the landlord to check the credentials of a potential tenant to verify their employment and any references to understand their character. The lessor is allowed to charge a small fee for providing this measure. Association of Realtors – Provided by the Greater Las Vegas Association of Realtors for all residential tenancies. Commercial Lease Agreement – In accordance with Chapter 118C this form is designated for property related to a business use. Lease with Option to Purchase (Lease to Own) Agreement – Standard residential contract that offers the lessee the right to buy the property in accordance with the agreed upon provisions. Month to Month Lease Agreement (NRS 40.251) – Allows for the occupation of property that can be cancelled at any time with at least thirty (30) days’ notice by either party. An additional thirty (30) days is required by the landlord for tenants who are sixty (60) years of age and older. 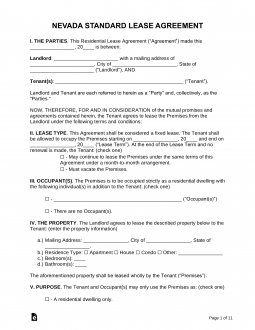 Room Rental (Roommate) Agreement – Created for multiple persons living in a shared residence to establish rules and how much each individual must pay for utilities and expenses on the property. Standard Residential Lease Agreement – For a fixed term arrangement usually lasting one (1) year. Sublease Agreement – Allows a tenant who is seeking to get out of their lease early to allow someone else, “subtenant”, to take their place and continue making payments on their behalf. Termination Lease Letter (NRS 40.251)– By the lessor or lessee to give the other notice of their intention to terminate a tenancy at will (month-to-month agreement). This termination must be made with at least thirty (30) days to Tenant(s) under sixty (60) years of age and at least sixty (60) days for those over sixty (60) years old. Fees (NRS 118A.200) – Any fee that is non-refundable must be stated in the rental contract. Foreclosure (NRS 118A.275) – If the property has foreclosure proceedings pending it must be stated to the lessee. Lead-Based Paint – For the disclosure of residences built prior to 1978 to let the tenants know of the potential existence of lead paint in the interior walls and ceilings. All habitants should be on watch for any chipping or cracking paint. Move-in Checklist (NRS 118A.200) – A signed accounting of the current condition of the property must be completed at the time of occupancy. Nuisance/Violation (NRS 118A.200) – A guide on the steps to report a nuisance or violation on the premises to the proper government authorities. According to NRS 118A.330, except in the case of an emergency, the lessor must always provide at least twenty-four (24) hours notice before going inside the tenant’s leased premises. Maximum (NRS 118A.242) – Landlord may ask for up to the equivalent of three (3) months’ rent. Returning (NRS 118A.242) – Within thirty (30) days of the end of tenancy the lessor must give back any funds to the tenant associated with the deposit.